Bucky Harris was the boy wonder of baseball. He won the World Series as a 27-year-old player-manager for the Washington Senators in 1924. He drove in seven runs to lead the team in its Series win overJohn McGraw’s New York Giants. He was a star second baseman for 12 sea-sons, and he setputoutrecords during a season (479) and a World Series (26). He had a .274 lifetime batting average. He managed for 29 years, winning 2,159 games. He led the Sen-ators to the pennant in 1925, and managed the New York Yankees to a World Series win in 1947. He also managed the Detroit Tigers, Boston Red Sox and Philadelphia Phillies. Harris spent 40 years in the majors as a player, manager and executive, holding front-office positions with the Red Sox and Sen-ators. 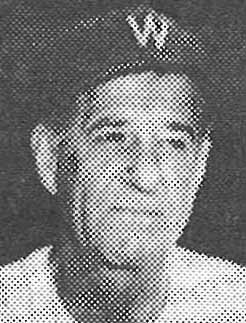 In 1975, Harris was elected to the Baseball Hall of Fame in Coo-perstown. He died Nov. 3, 1977.